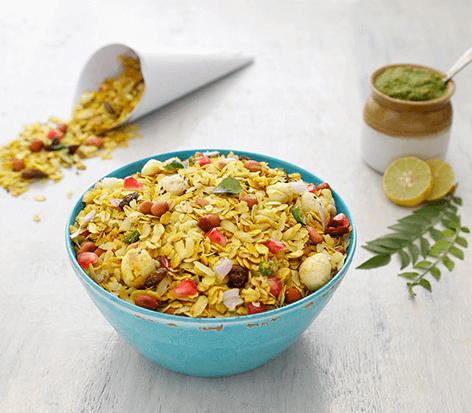 A wholesome, sweet and tangy twist to traditional chivda namkin. Dry roast whole oats in a non stick pan for 6-7 mins or till crisp and golden. Keep aside. Dry roast poha for 3-4 mins till it turns crisp. Heat ghee in a pan, splutter mustard seeds. Add cumin, curry leaves & whole chili. Toss in peanuts, foxnuts and roasted oats and saute for 2 mins. Add poha, raisins, sugar and seasonings. Mix well. Turn off the flame. Cool the mixture and store in an air tight container.